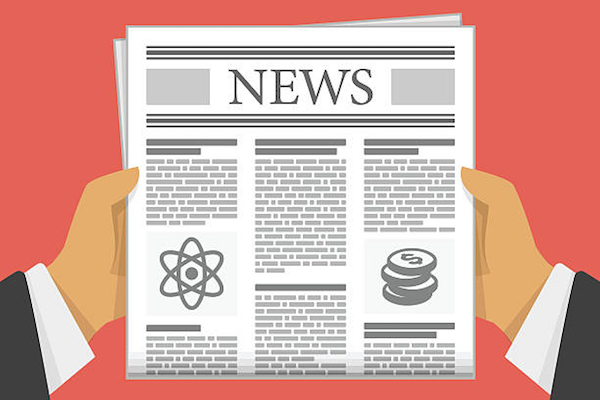 Since our February newsletter we have seen the results of the hard work put in by the committee making Beerfest another successful event for the club. A excellent number of entries were received and were well spread over the categories which was pleasing. Hayden Henderson, a brewer without a club won Champion Brewer for his American Brown Ale with points of 127. Hayden also cleaned up by winning the best novice brewer as well as he had not previously been placed in any VicBrew competition. Congratulations Hayden, and we look forward to meeting up at this months’ meeting so that you can pick up your winnings. 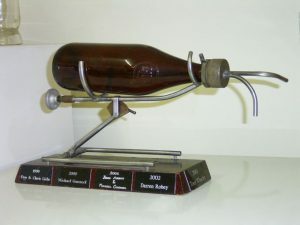 Club of Show was Bayside Brewers who were helped along the way by Bryce van Denderen who was Champion Brewer . Congratulations to Bryce and to Bayside. 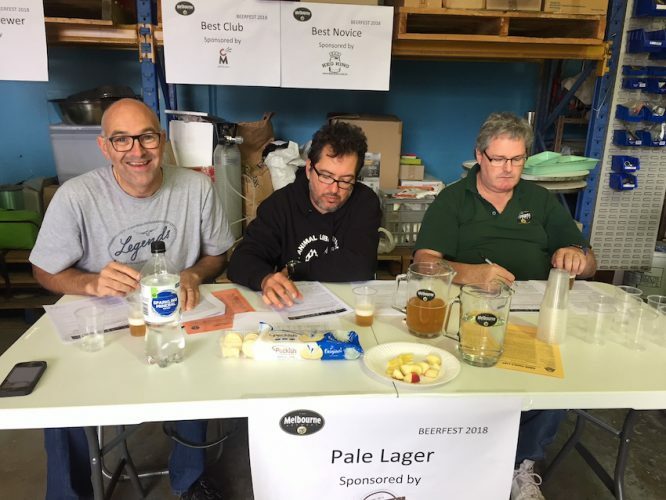 Our own club saw John Keske win Pale and Bitter Ale with his Kolsch and Roger Cheeseman with a second placing for his Weissbier in the Wheat and Rye category. Well done boys. 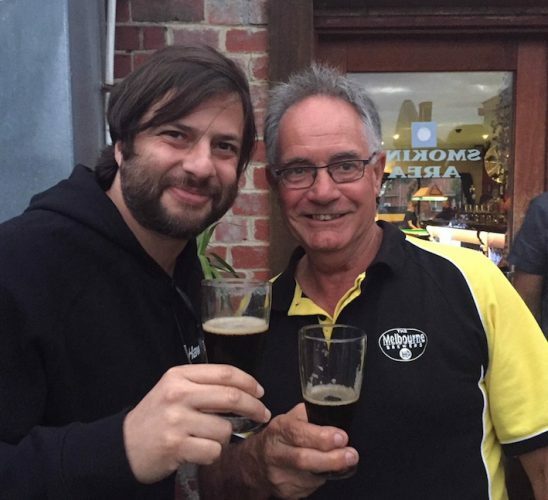 At the last meeting which was at Foragers Drop, Hawkers Brewing CEO Mazen Hajjar was on hand to introduce Hawkers IPA produced with the South African hops. Also on tasting was two saisons and a stout brewed by members of our club. Mazen has such an interesting story to tell as delivers it in such a down to earth knock about way. We hope to pay a visit to Hawkers and be given the tour. 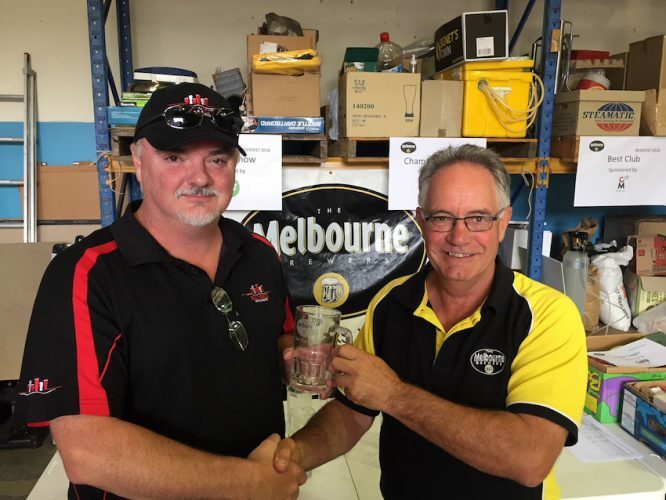 Roger Cheeseman and myself visited Merri Mashers to present members of their club with their Beerfest prizes. We were made more than welcome and enjoyed their club night. 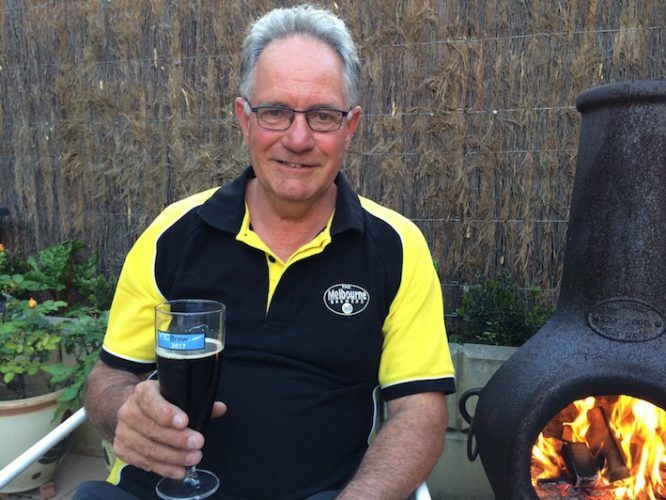 Steinbrew weekend was made a little more difficult this year to brew beer in the bush with a TOTAL FIRE BAN day declared. 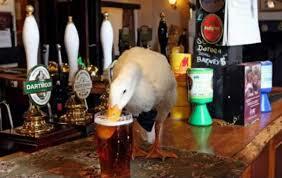 The numbers attending were down, however a beer was brewed although the hot rocks treatment had to be given a miss. The success of the brew will be tasted at the dinner later in the year. 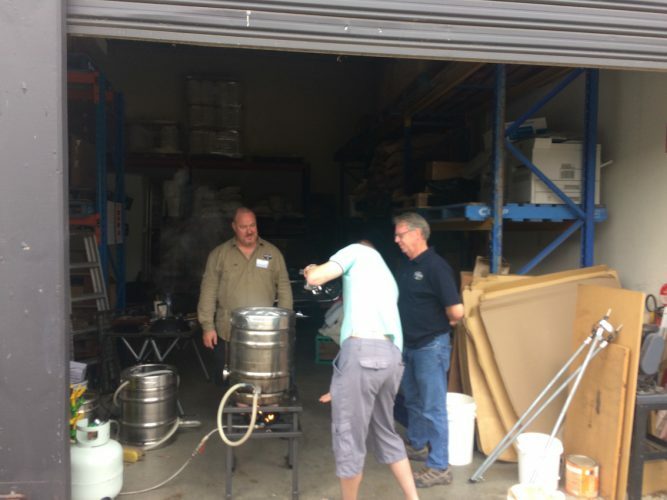 The dinner is to be held in July and so it is time to think about brewing a batch that will be paired and enjoyed by fellow members at that dinner. There will be inducements to encourage members brewing a batch for this advent and a monster brew day is also being organised to help the process. 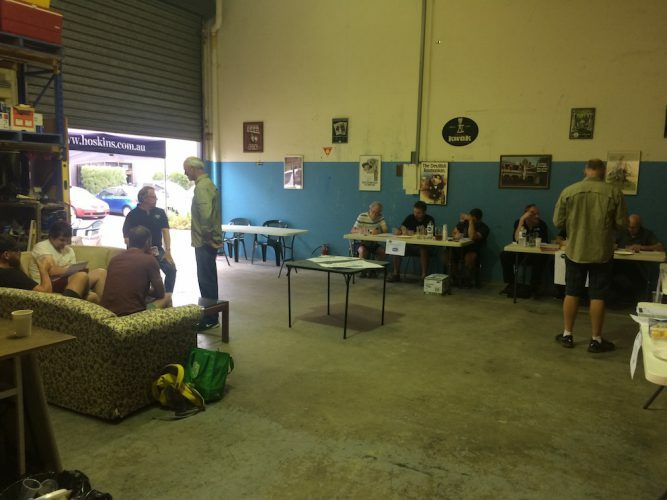 This months’ meeting is back at Pete’s warehouse and we have an in house competition with Belgium Style beers. Hope to see you there on Wednesday 28th March. Wednesday 28th of March at the usual haunt of Pete’s warehouse in Ferntree Gully. Don’t forget to bring down a Belgium style beer for the in house Competition. I was born in Box Hill, but I have lived all over the place, including country NSW, Sydney, New Zealand, the USA, China. Fortunately, working IT, my skills are portable and have permitted me to live in all these places for various amounts of time without many issues of finding work, except post 9/11 in the US, when getting work as a foreigner sucked badly !! I have 2 teenage kids that keep me busy and I am studying for a masters degree in my spare time. My wonderful family bought me the ubiquitous Coopers Kit as a Fathers day gift (Something my wife has been kicking herself for ever since) about a year or so before I joined the club. Initially it was to reduce costs.. then it was because I could make things to my own liking, rather than what was allocated to me. I brew whatever I feel like, using whatever I feel like. I sometimes still throw a kit in for things like the clubs “Get Your Kit Off” comp and occasionally, someone will throw me a kit they had lying around. Sometimes I need to bump my gravity up on bigger beers, so I throw in some extract. Don’t judge me !! I’ve lost count but Brewtoolz says I have done 111 but if you throw in the pre Brewtoolz era and the few I have not recorded, it’s probably a few more than that ? Pales, IPA’s, IIPA’s and the occasional Saison and Russian Imperial Stout. Is that also your favourite style to drink? Do you have a favourite commercial beer? I tried the Dainton’s Cherry Wood Smoked Rye Baltic Porter the other day and I’m in love !! I have a BIAB setup that utilises 2 vessels to speed my brew day up. In summer, if I am organised, I can crank out 3 batches in a day in the longer days in Summer and still be cleaning up in daylight.. but I emphasise ORGANISED… that an no stuff ups 😊 Otherwise, I can still get 2 brews through in winter using my setup. Hmmm.. I have a couple: my Refractometer for measuring gravity at any stage in the brew process and my pumps for moving stuff around between various places. If in doubt ask someone. Use the wisdom in the club to help you on your journey. And don’t forget to pay it back later ! The infinite variety I can achieve in every brew.. even doing the same brew over and over yields a slight variation in some way.. sometimes better, sometimes not so much. Renovating, home maintenance, Uni study, tinkering with stuff etc. 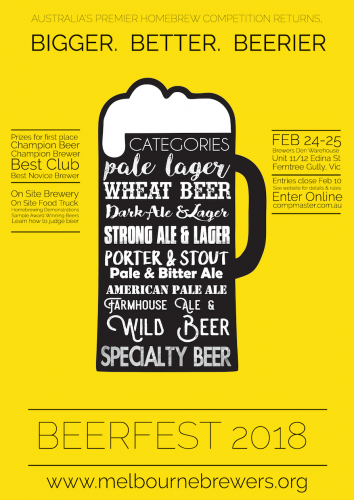 Our sponsors have put up some fantastic prizes this year in support of the Home Brewing Community. Lets show them some love back and get behind them when you next do your shopping or recommend a store to a new brewer. It’s these sponsors that keep our competitions running so lets return the favour and support them any way you can! 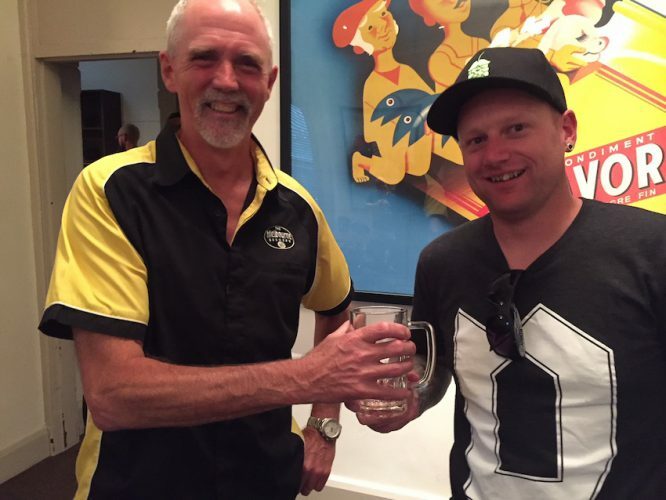 Clint Bee (right) from Merri Mashers taking the award In Wheat and Rye from Roger who he only just knocked off. Bryce Van Denderen from Bayside taking out the “Champion Brewer” award. The bartender brings him the three beers, and the man proceeds to alternately sip one, then the other, then the third, until they’re gone. A special reminder needs to be put out for everyone to get their Annual fees paid if they still haven’t. Merri Mashers IPA Comp on 25th of March. 28th of March, Internal comp on Belgian Ale. 21st of April, Belgian Beerfest. 30th of May, internal comp on Stouts. 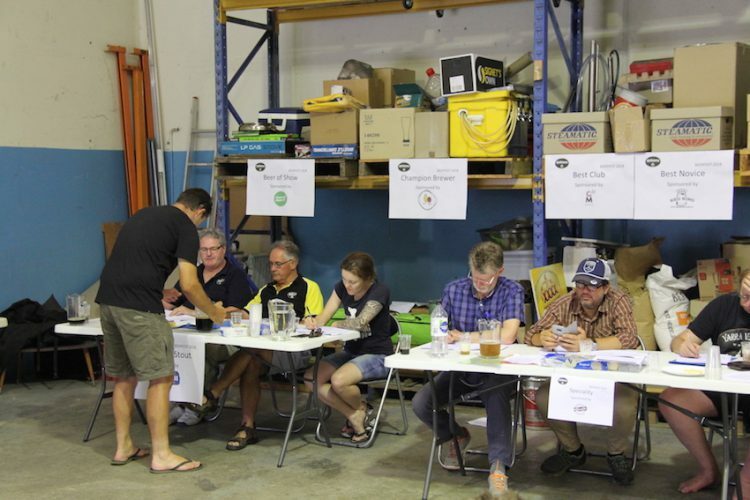 Grafton Brewing Competition entries close 6th of April. 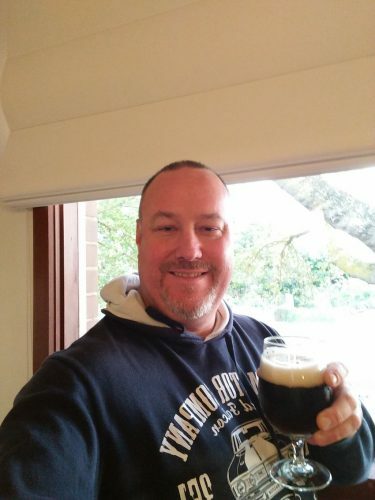 1st of July, Stout Extravaganza by Westgate Brewers. 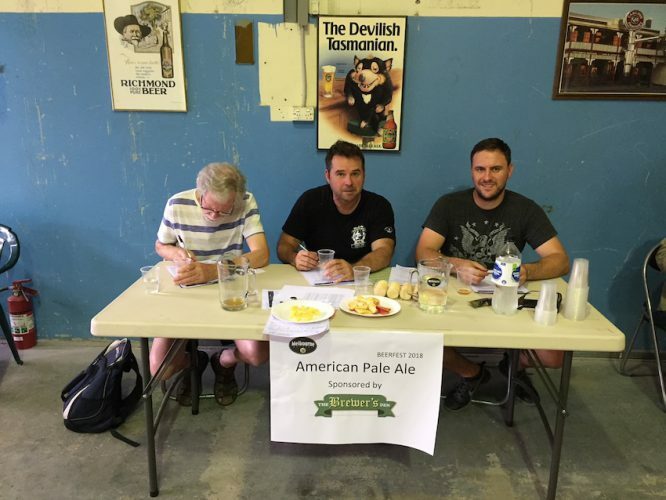 25th July, Internal Competition on American Pale Ale. Pale Ale Mania by Worthogs, date to be confirmed. 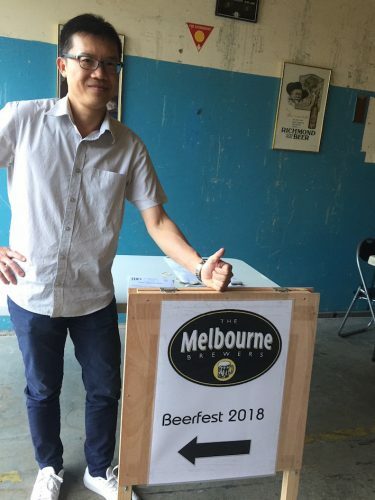 Vicbrew 2018, date to be confirmed. 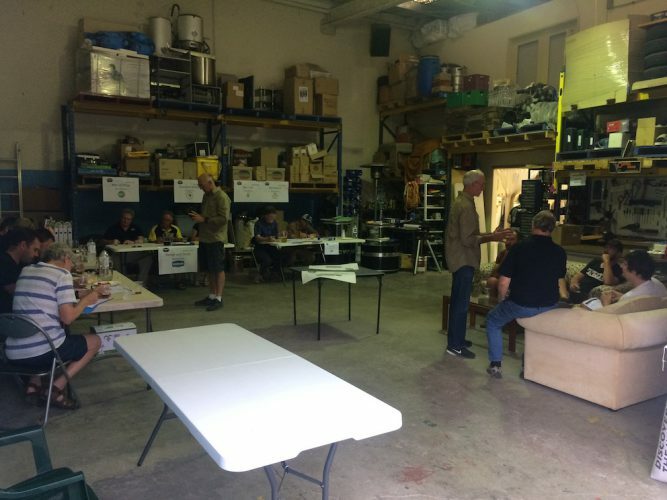 26th of September, Internal Competition on Bitter Ale. Octoberfest by Bayside, date to be confirmed.